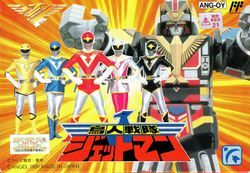 Choujin Sentai Jetman is a game for the Nintendo Family Computer loosely based on the Super Sentai season of the same name. Using the same engine as Shatterhand (which was a Metal Hero (another tokusatsu-based game in Japan, Tokyuu Shirei Solbrain to be precise), the game has the player going through each stage of the game, fighting bad guys until meeting the monster of the week, then followed by morphing the Jet Force's mechs into the Jet Garuda and Jet Icarus to finish the baddie off. An interesting note about this Sentai was that it was the season before Kyoryuu Sentai Zyuranger, which would become the basis for the first season of Mighty Morphin Power Rangers. This page was last edited on 14 December 2017, at 13:51.